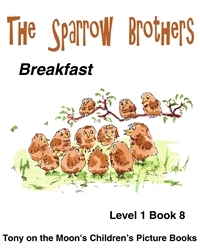 The Sparrows Brothers were sitting on top of the barn. Miss Daisy Mazy was in the farmyard throwing food out for the chickens. “Breakfast” said one of the Sparrows.